As you may or may not know I have recently taken up the guitar. This is something I have always wanted to do but, never had the time to do it. For years it has been on my bucket list and I even had two guitars, one my husband gave me years ago and an electric guitar I won at a silent auction. At my first lesson, I was told the old guitar I brought in was broken and also too big for me. I had no idea guitars came in different sizes so I bought a brand new one that fits me perfectly. Now, I have three guitars and need to design a spot for them which caused me to seek out beautiful in-home music rooms that allow you to safely store your musical devices and a spot where you can be comfortable playing them. I learned to play the piano as a young girl and I use to enjoy sitting down at my piano and playing it as loud as I could just because it felt good. Not so sure my family appreciated it and I think that is why many people have a dedicated room to sit and practice their music in. Many people that are into playing music start out with one instrument and graduate to others just like I did with the piano and then the guitar. If I am able to master the guitar I’d like to try my luck with the fiddle. That being said, it’s important when designing an in-home music room to take inventory of the musical instruments you play and possibly will be playing in the future so your new room can accommodate them. The open room concept works well for families with multiple musicians. Possibly it is where the kids sit with the parents and practice their art together. For musical families, this design works well for jamming with each other or performing for friends. I love the idea of introducing music to children early and incorporating an atmosphere of music into their room design. This allows children to freely try different musical instruments and finding one that resonates with them early on in their life. Giving the gift of music is a life-long gift they will have with them their whole life. 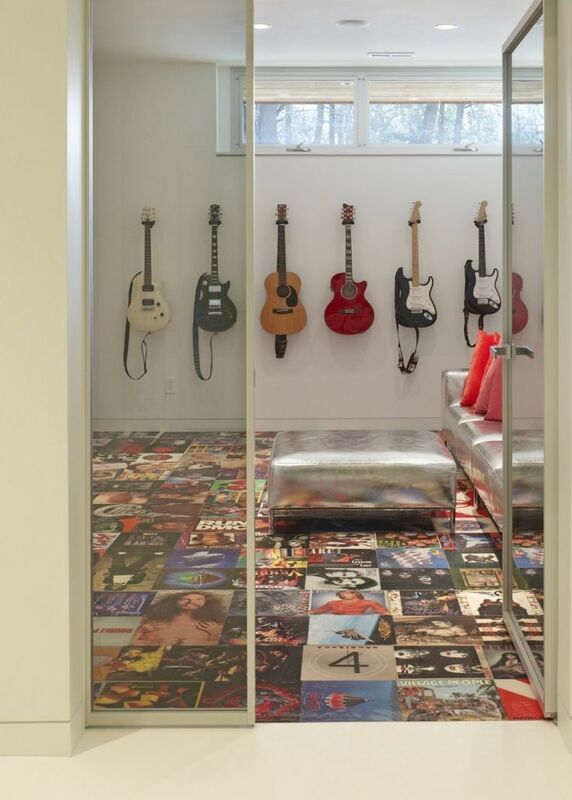 Interior Designer, Claudia Couto, designed this space to encourage children to develop a love for music. Jenny Komenda, the author of, Little Green Notebook, created her personal music room in her Arizona home. She used her stringed instruments as her artwork for the space and it protects them from getting damaged. Guitar wall hangers can easily be purchased online and cost around $10.00. The great thing about a guitar is that it doesn’t take up a lot of space, especially when you are just starting out. A simple wall hanger in your family room is a great place to start and a comfy sofa to sit down on and begin playing. I do believe that music is the universal language that appeals to everyone and adding a room to your home to inspire you to either play or just listen is a really good idea! Dorm Room Designs That Work!